Bridal Sarees are extravagant and ultra-luxurious sarees, with complex, intricate and extensive embroidery and embellishments. Created specially to make you look the most gorgeous on your special day. In India, weddings are a known to be over the top and are celebrated as a commemoration of great festivity and happiness. Indian weddings last for as long as a week, filled with fun, dancing, singing along with relatives and friends with blessings and adorations being showered upon the happy couple. Bridal sarees are created specifically to make the bride of the day be the center of everyone’s attention, considering that she, above all must look her most beautiful on her most important day. And here’s where the magic and enchantment of Bridal sarees spreads its wings.They are created with the sole purpose to dazzle everyone with heavy and complex embroidery work all over the garment. The base fabric usually used for bridal saris are in the shades of red, pink, cream or beige and are quite desired and sought after. Fashion designers love to create bridal attires and especially bridal sarees as they are like blank canvases, waiting to be worked upon by creative minds and skillful hands. Designers nowadays create stunning pieces of Bridal sarees, incorporating rare and complex handiworks along with the use of fancy and unconventional fabrics, which results not only in beautiful Bridal wear Sarees but also ups the bride’s glamor quotient on her most special day or night. 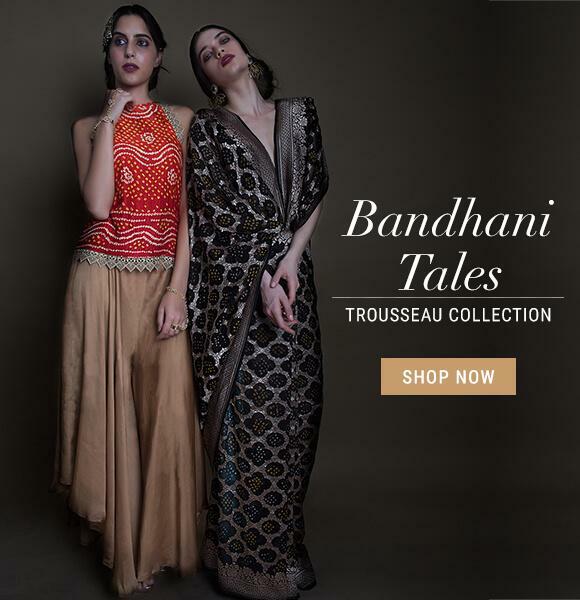 Indian Bridal Saree collections usually showcase intricate embroideries, craftworks and embellishments that elevate the grace and elegance of the ensemble manifold. Some of the works on Bridal Saris include Zari work, Zardosi work, Resham, thread work, stones, stone embroidery, diamante, patch work, kundan work etc. Other popular works include sequins, kardana, digital prints, narrow and broad velvet borders, lace borders etc. The designers of such beautiful Bridal sarees know that the attire you want to wear on your special day must have some of your own style or essence. They know that every Indian girl dreams about their wedding attire. To keep this special feeling intact, designers happily incorporate your design ideas and suggestion to make your Bridal Saree all the more special. Check out latest collection of exclusive designer Bridal Sarees, online at KalkiFashion.com and find the one made just for you! Bridal sarees are no different than traditional sarees and are meant to be worn the same exact away by draping the saree around the body and then creating pleats and tucking them under the inskirt or petticoat at the waist. The loose end is then wrapped around the back of the shoulders or left loose to hang over one shoulder. However different regions have specific saree draping styles particular to that region or community in which case follow your traditions but wear it like you mean it. Head on over to kalkifashion.com, where you can find an extensive collection of the latest Bridal sarees online at great prices. Kalkifashion provides you with Free Shipping of our products worldwide and also the option of Cash on Delivery. 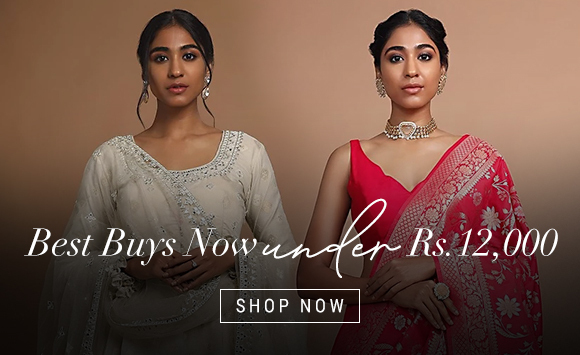 Also, when you sign up with Kalkifashion, you get an 11% discount on your purchase of a Bridal Sarees online from our exclusive collection. We also have a ‘no questions asked’ 30 days Return and Refund policy to keep your satisfaction at utmost priority. Just sit back at the comfort of your home and browse through our fashionable and highly curated collection of Indian Bridal sarees in all their glory and variety, only on kalki. We at kalkifashion.com constantly strive to offer you the best and the most beautiful apparels online. Buying Bridal Sarees online saves your time, energy, money and is extremely simple. You can get offers and discounts if you shop for Bridal Sarees online. The price of online sarees is very affordable and is inclusive of the shipping cost.